This tuna salad recipe is an easy lunch recipe. It can be made quickly and has a nice crunch thanks to the diced green peppers. This post was originally published April 2013; it has been updated with new pictures and text July 2016. Ever since I was diagnosed with an adult-onset shellfish allergy, I have been craving seafood. I guess you want what you can’t have. We have been eating a lot of salmon and tilapia since then. Occasionally I splurge on some halibut because we love it so much. We also eat a lot of tuna. 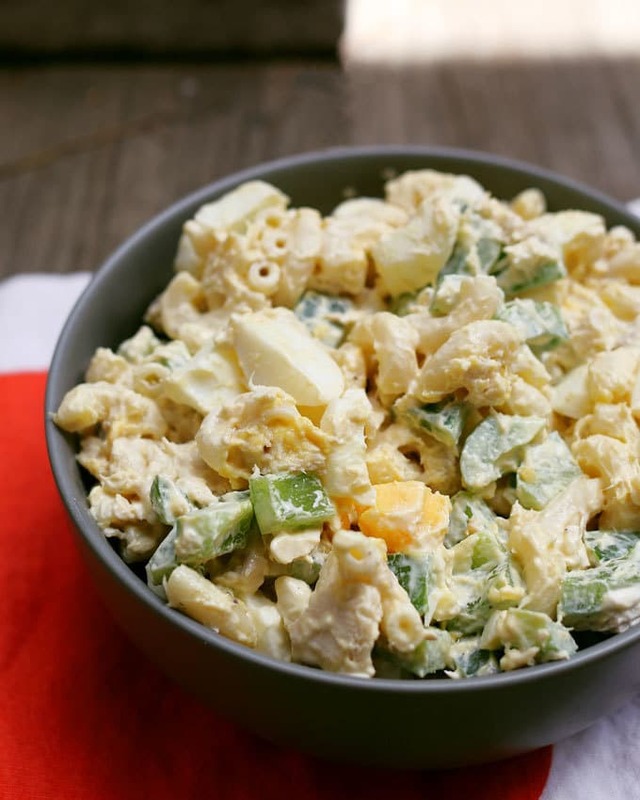 I love this easy boiled egg tuna macaroni salad recipe and have been making it for years. Before I learned how to really cook, this was one of my go-to lunch recipes. It’s so easy that even I couldn’t screw it up. 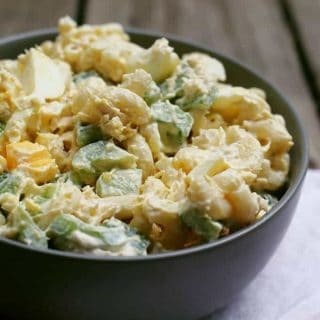 When Mr. B needs food for work and I’m short on time, I often make this tuna macaroni salad because it’s so easy and filling. Adding the boiled eggs is great because you get all of that added protein. This boiled egg tuna salad recipe really is one of the easiest lunches and has only a few ingredients. 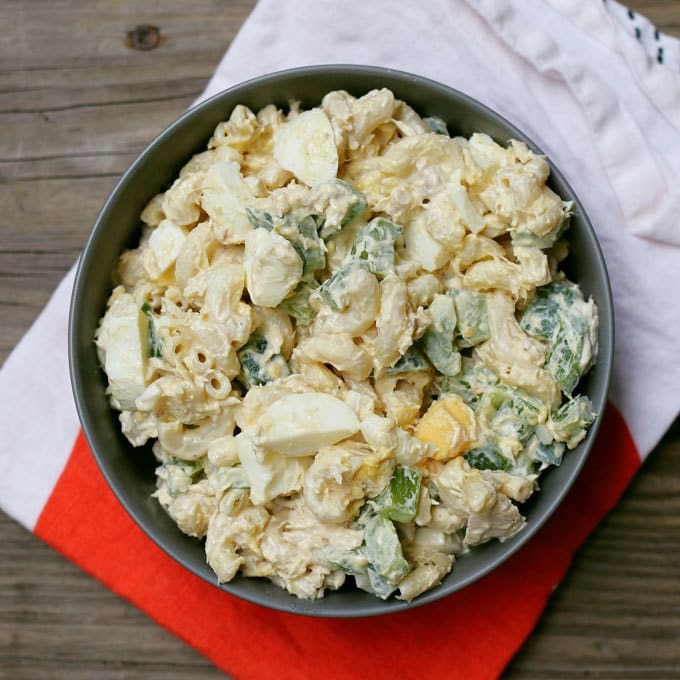 Our go-to vegetable for this macaroni salad is green bell peppers. I love the crunch and splash of color. Make sure you cover the bowl well with plastic wrap or tin foil while it is chilling in the refrigerator. Plus, keep it on ice if you adding this as a summer BBQ side dish; treat it like any macaroni or pasta salad. 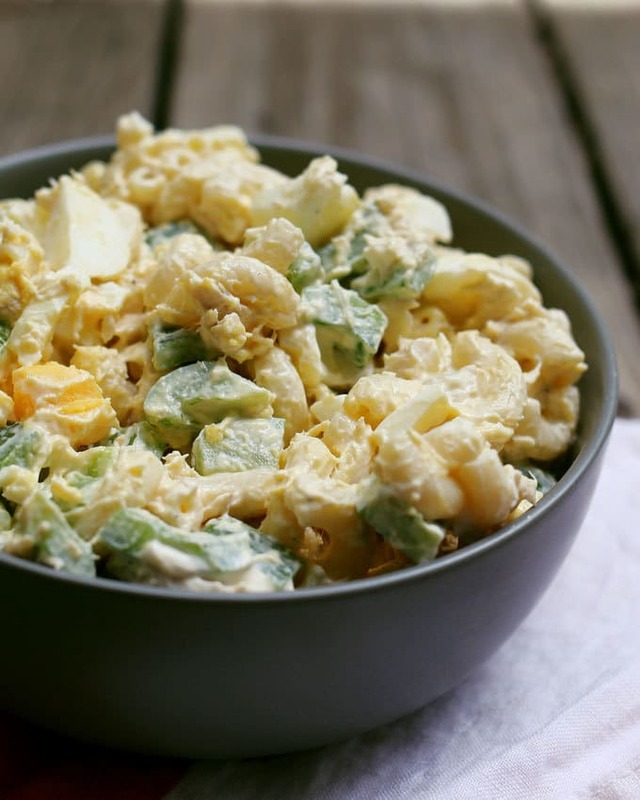 This boiled egg tuna macaroni salad recipe is an easy lunch recipe. It can be made quickly and has a nice crunch thanks to the diced green peppers. Drain water from tuna. Dice hard boiled eggs. Combine all ingredients in a large bowl. Looking for another pasta salad? 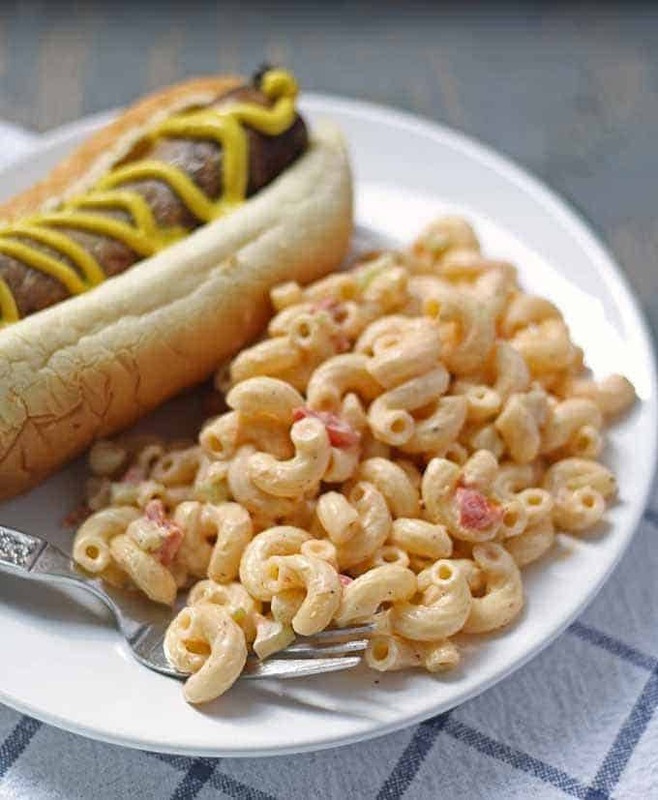 Try this deli-style macaroni salad. 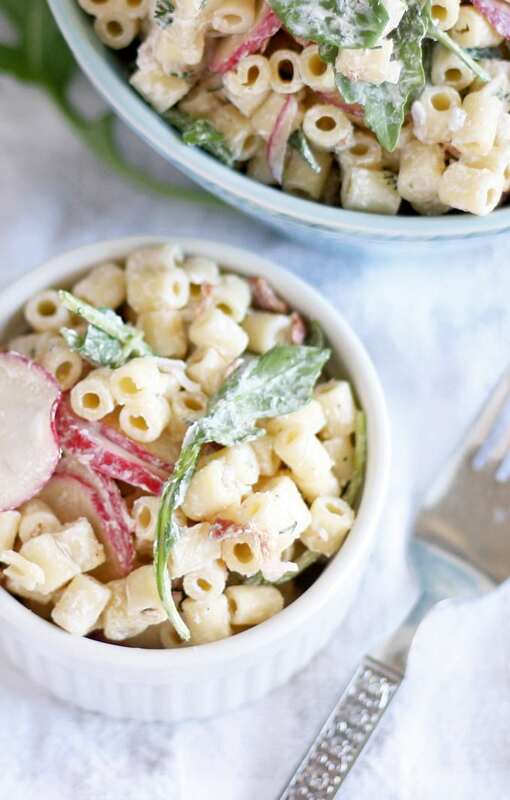 Also great – this spring pasta salad recipe with radishes and arugula. 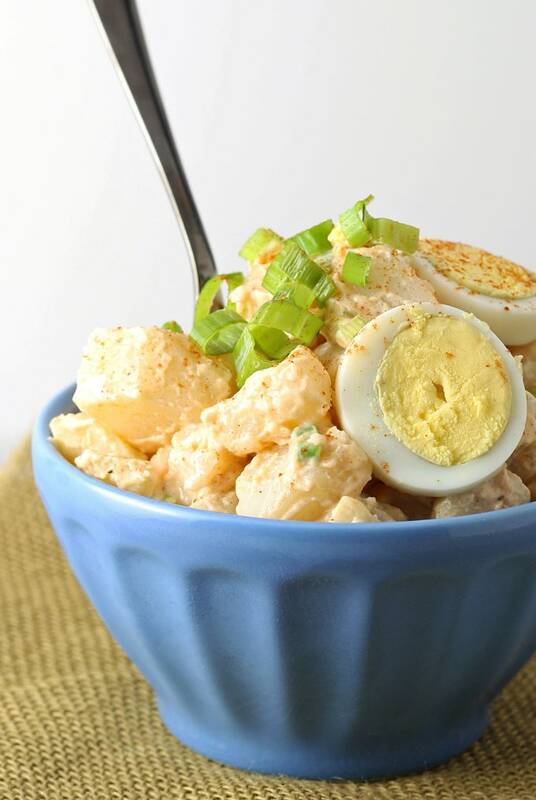 Perfect for BBQs – this potato egg salad. It looks like a yummy dish! And good work on the collage; it’s coming along nicely! Whoa! If you forgot to eat, then it must be pretty addicting! Thanks!! I would love to hear what you think after you try it. Have a great Sunday! I love adding egg to my tuna salad for extra protein, but I never thought about throwing in some pasta too! This sounds so yummy and filling! Yum! I love tuna salad and I love egg salad. This recipe looks like the best of both! Thanks for sharing at Family Joy Blog Link-Up Party. Have a great week! This looks and sounds delicious! Thanks for sharing on the What’s for Dinner link up! 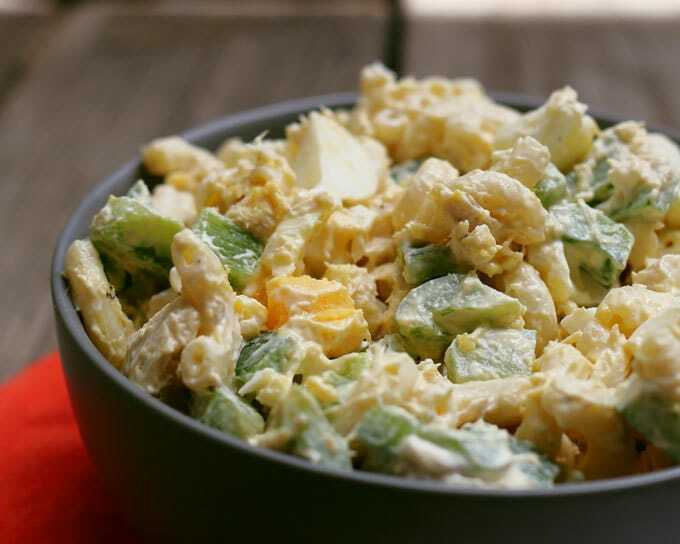 I’ve had egg salad and I’ve had tuna salad but never together. I love them both so I’ll have to try this! Thanks for linking up to the Creative K Kids’ Tasty Tuesday I look forward to seeing what you create next week. This sounds so good and it would be perfect for a cookout or picnic! Thanks so much for sharing with us at Share The Wealth Sunday! Such a delicious dinner!! mmmmmm I wish I had a big plate of this goodness!